Why Mini Heartstart for Sports Clubs? Many individuals who suffer a cardiac arrest will die unless resuscitated within minutes. 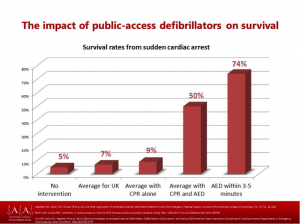 'Immediate action by performing CPR and defibrillation doubles the chances of survival'. The only way to save a person suffering a cardiac arrest is by early intervention of effective CPR and by shocking the heart with a defibrillator, delivering an electric current to the heart, momentarily stunning all movement and allowing the heart to reset itself. Sudden cardiac arrest occurs in seemingly fit people. In the UK, there are 60,000 cardiac arrests per year in the community. Half are witnessed, often by family and friends, and treatment by emergency medical services becomes possible. The survival rate in this group is only 10%. Starting CPR could help reduce 27,000potentially survivable deaths. Sudden cardiac arrest does not discriminate between age or physical fitness levels, with high– performance athletes and fit and healthy young people (12 - 35 years old) losing their lives to sudden cardiac arrest. In the UK there are over 650 potentially avoidable deaths per year of young people (12 – 35years old) with unrecognised heart conditions (SADS). But only by 2-3% for every minute if CPR is instigated! Early advanced and good post resuscitation care. Once the heart stops, death starts. The early intervention of effective CPR and shocking the heart with a defibrillator can save someone's life. Delivering an electric current to the heart, via a defibrillator, means that the heart can restart. CPR will not harm anyone who needs it and Public Access Defibrillators (PADS)do not deliver a shock if it is not required. There are literally thousands of lives that could be saved. Minutes are vital - the chance of survival decreases by 7-10% for every minute of delayed intervention but only 2-3% for every minute if CPR is instigated. 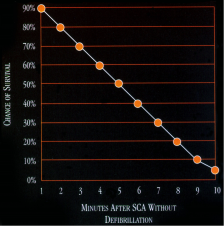 Effective CPR combined withearly AED usage can double survival rates.